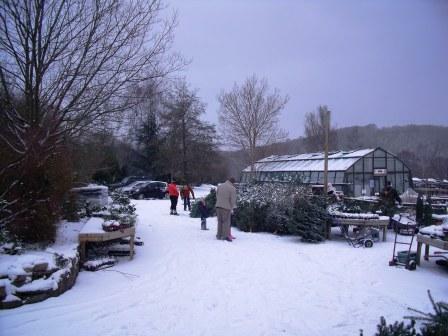 A sprinkling of snow is just what is needed to put you in a festive mood and here are a few customers braving the cold and getting in early to pick the best trees! It seems the big freeze will be with us for a while so we may get to have a White Christmas this year! If you are wanting to impress your friends and have the space we have a small selection of larger Non-Drop trees from 8ft to 13ft! We can even deliver (locally) if you can’t fit them in your boot! A year on and its time for Christmas Trees again. This year we have an even greater selection of fresh Devon grown trees. 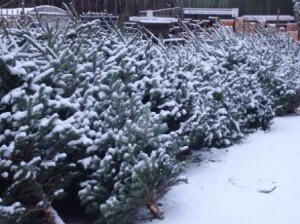 We have traditional Norway Spruce and as well as a great selection of non-drop trees. 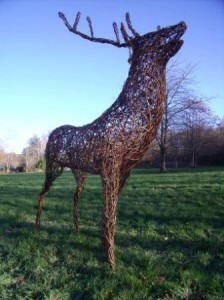 We have just had our first delivery and the quality looks superb this year. And what better weather for choosing your christmas tree, cold, crisp and a light sprinkling of snow……Just like a scene from a christmas card. This is a new piece of copper foiled glass entitled ‘The Castle’. Its inspired by Mussorgskys ‘Pictures at an Exhibition’ after a call by the EMG Symphony Orchestra for Devon artists to create work inspired by a movement from it. The EMG will be preforming Pictures at an Exhibition at Exeter Cathedral on 25th November at 7.30 where you can view this and other artworks. http://www.emgsymphonyorchestra.org/ for details.. The Emperor Returns to the Exe Valley! It’s been a while since our last blog…. Over the last couple of weeks we have been busy taking the first of our autumn deliveries as well as attending Bampton Fair. New in are the latest stock of seeds from Kings, as ever these represent excellent value for money. For those you love the scent of a Rose we have just potted our selection of Climbers, HT, floribunda and English shrub roses. We have tried to select those we consider to have reasonable disease resis tance, repeat flowering and scent. This long autumn is a perfect time to plant Bulbs and we still have plenty to prepare your garden for a blaze of colour this coming spring!! Top of the bargins are 7.5Kg Daffodils for only £8.49 perfect if you want to make a show. We’ve already had several frosts here at Cove and this has meant that the birds are feeding like crazy building up reserves in case this winter is in any way as harsh as last years. We have in stock a good range of Wild bird care feeds and products so the wild birds won’t go hungry this winter. On Sat 2nd Oct between 10 and 2 we will be hosting a coffee morning raising money for Project Mobility. They are a locally based charity supporting troops rehabilitation and providing fully accessible vehicles for off roading, green laning, confidence building and international expeditions. Check out www.projectmobility4x4.org for more details. The coffee has been provided by Land Rover (yes they make coffee too!) in support of Project Mobility and this will be our last time in the tea tent before it gets packed away for the winter. So come along and make a difference! 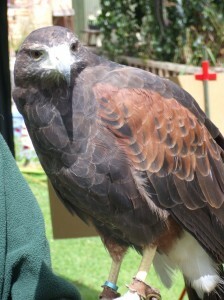 For those who may have missed North Devon Hawk Walks this August, Nigel and Lady Macbeth will be back with us for the last two Thursdays in September 12 till 3. 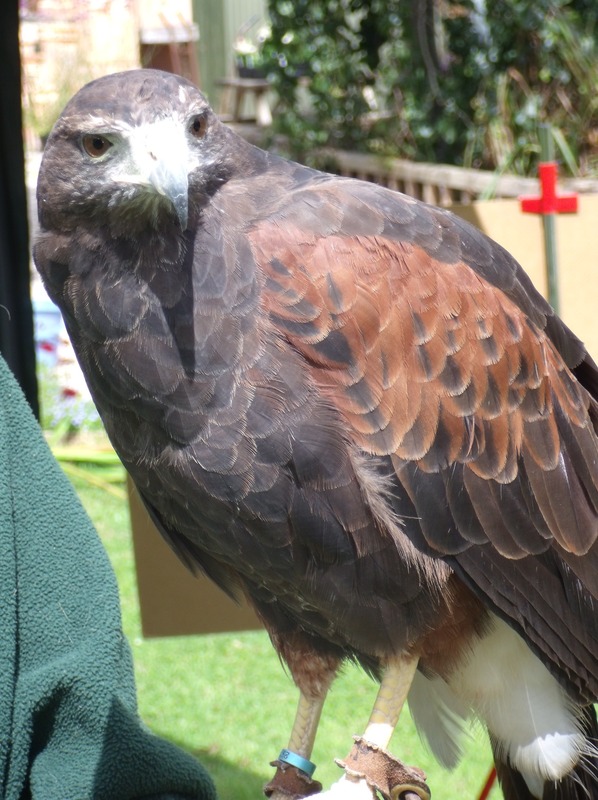 (Weather permitting) As we seem to be enjoying a bit of an Indian Summer why not pop in and get up close with this beautiful Harris Hawk before we all go into hibernation! This giant marrow weighing one stone has been bought in by one of our customers! 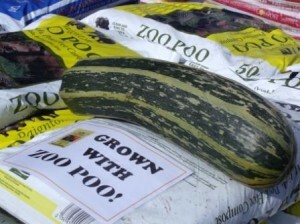 Grown with Zoo Poo we are not sure if its a record breaker but it can certainly feed a lot of people. For anyone who has been wondering how effective the Paignton Poo is here is proof! So next year if you are planning to grow a record breaking vegetable make sure you feed your soil with some Zoo Poo and feel satisfied in the knowledge that you are also supporting Paignton Zoos conservation efforts! Check www.ecosci.co.uk for more info. With the weather becoming Autumnal already, it seem appropriate to mention our new stock of Spring Flowering Bulbs. We have a good selection to provide colour in your garden from Christmas well into next Spring. We even have some beautiful Autumn Crocus that will soon be putting on their annual display. We have several varieties of daffodils loose so that you can pick and choose at the best prices. Some great bulbs for underplanting containers & winter baskets such as Tete a Tete Narcissus, Crocus, Muscari and of course Tulips. For the woodland garden we have some English grown Bluebells, Anemones, Narcissus and Snowdrops (among others). If its scent your after then is has to be Hyacinths both for the house and the garden! The wild bird feeding season is well under way with birds building up their reserves either to ge them through the winter or to make their annual migration. Encouraging birds to feed in your garden has to be one of the most rewarding things. Not only do you get to see these beautiful creatures up close but many have an essential part to play in controling pest populations. 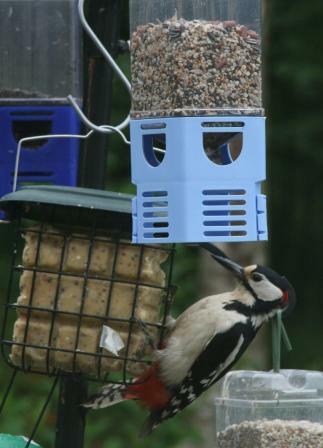 We have good stocks of wild bird feed from seed, peanuts, fat snax, sunflower seed and thistle seed & suet feasts. We also have a selection of feeders, Nest boxes and accessories. Well I’d like to say we are enjoying lovely long August days dipping our toes into the water and drinking Pina Coladas but this being Devon and the school holidays, summer is doing what it normally does and its either raining or really windy here! 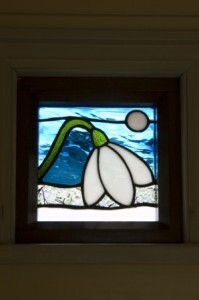 But we are not discouraged its still beautiful in Cove whatever the weather! I hate to mention autumn but the leaves are definitely starting to change colour here, so with that in mind if you are thinking of the new term ahead and are wondering whether to join a class at night school or learn a new skill I will be offering 1 to 1 tuition in copper foiling this autumn. If you’ve fancied having a go I will show you how to cut glass and then assemble a panel or large sun catcher to take home with you. Get in touch for a chat or email for details. 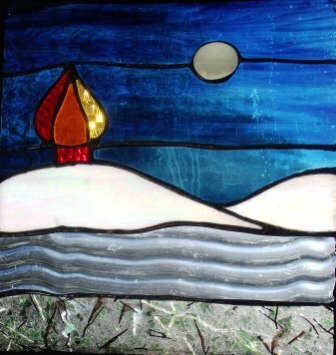 Talking of copper foiling I recently made a snowdrop for a shepherds hut. 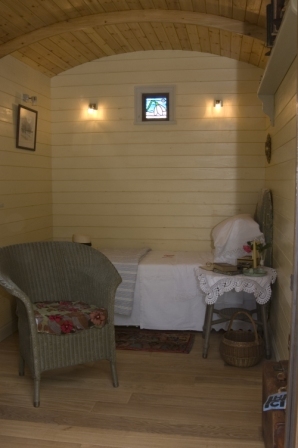 The very nice people I made it for have sent me the images of it fitted in and it looks fantastic. They are a company called ‘Dods of London’ and they will have a stand at the National Gardening Show at the Bath and West Showground in September if you want to have a look at it. 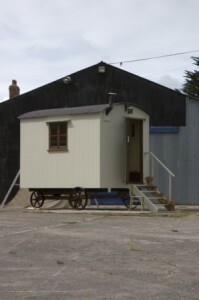 They restore shepherds huts and gypsy caravans to a very high standard and I want one! Will link onto their site when its up and running but here is what they look like below!